Along with FedEx, the package-delivery giant saw a strong peak season, but there are signs of weakness from the economy. United Parcel Service (NYSE:UPS) delivered a solid set of results demonstrating its ability to deal with peak demand during the holiday season. This is all the more impressive because UPS and FedEx (NYSE:FDX) had both already signaled a strong holiday shopping season. Following the disappointments of the last two years, the fact that UPS made it through the holidays unscathed is extremely welcome news. That aside, there were some complex trends in the earnings report. Adjusted operating profit increased 17.1% in the fourth quarter and adjusted diluted EPS increased a whopping 26%, and all of this came despite revenue rising just 1%. The reason? For the first time since 2012, UPS executed during peak season and managed to cut operating expenses. Reported operating expenses decreased 7.5% compared to the fourth quarter of 2014. This comes after two years where adjusted operating costs increased 9.4% in 2014 and 7.3% in 2013. In the previous years UPS had to aggressively increase contract-carrier spending, equipment rentals, and take on additional equipment and labor. FedEx also had issues with the severe winter of 2013, but its relatively easy peak season in 2014 left UPS, well, embarrassed to say the least. But the company delivered this time around, and that's what's important. Dimensional weight pricing whereby packages are priced by size as well as weight (FedEx has also implemented this on a wide scale). Pricing initiatives intended to smooth out peak demand. Increased focus on negotiating with customers. All of the above are initiatives that very well could restrain volume growth, or at least less profitable volume growth. 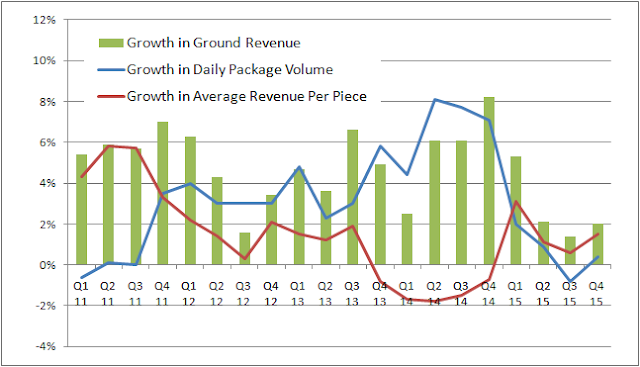 Indeed, as you can see in the chart below, UPS Ground (which contributes 45% of total revenue and 71% of U.S. domestic package segment revenue) saw weak growth in daily package volume. Data source: UPS. Year-over-year growth. The weakness of volume growth came up prominently in the earnings call, but it's unclear just how much of it is a consequence of a weakening economy or UPS' initiatives as discussed above -- something for UPS and FedEx investors to look out for and analyze in future results. Incidentally, the average revenue per piece data may look disappointing, but many stocks in the transportation sector, such as J.B. Hunt Transport Services (NASDAQ: JBHT) have seen pricing held back by lower fuel surcharges and have been similarly afflicted. While the headline focus is on UPS' peak performance, it was also a good quarter for its other operations. In fact all three segments reported double-digit operating income growth. 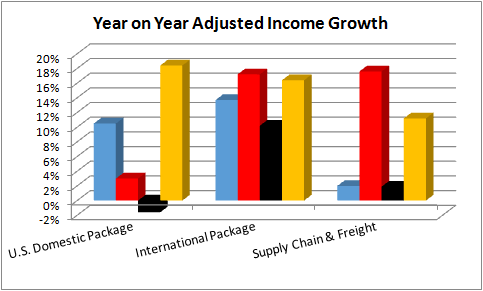 In particular, the international package segment capped off a strong year with a 16.4% increase in adjusted income growth. For context U.S. domestic packages contributed 62% of full-year adjusted income, with international package contributing 28% and 10% from supply chain and freight. Management's guidance for 2016 calls for diluted EPS of $5.70 to $5.90, an increase of 5% to 9% from adjusted 2015 EPS of $5.43, but excluding tax credits in 2015 it comes in at 7% to 11% growth. Clearly, a key part of hitting the guidance will relate to UPS' ability to manage and increase profitable ground volume growth in 2016. All in all, UPS' latest results point to a company that is hitting its stride operationally after several years of underperformance during peak periods.